446 people in our community are currently praying with you. As I travel through the rest of my day, may the God of hope fill me with all joy and peace in believing, so that by the power of the Holy Spirit I may abound in hope. And My covenant shall stand firm with him. So the field of Ephron in Machpelah, which was to the east of Mamre, the field with the cave that was in it and all the trees that were in the field, throughout its whole area, was made over to Abraham as a possession in the presence of the Hittites, before all who went in at the gate of his city. After this, Abraham buried Sarah his wife in the cave of the field of Machpelah east of Mamre (that is, Hebron) in the land of Canaan. The field and the cave that is in it were made over to Abraham as property for a burying place by the Hittites. 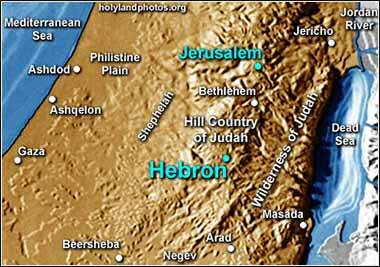 Genesis 23 recounts the founding of the oldest Jewish community in the world, at Hebron. Despite his extensive travel, Abraham's later years are spent in a fairly small area, a dry but fertile area in the mountains and valleys west of the Dead Sea. If you draw a line southwest from Jerusalem, Beersheba — the edge of habitable land before you reach the Negev Desert — is only 48 miles away, and Hebron lies halfway in-between. The Oak(s) of Mamre, where he stopped several times before, was a mile or so to the north of Hebron. He stops there early in his travels and returns to it several times, so perhaps it is accurate to call this area his home base, where he returns to die. In the New Testament, we don't encounter much of this area, because, although Christ was born in Bethlehem just to the south of Jerusalem, his life and ministry were centered far north of Jerusalem, primarily in Galilee. Today the region lies mostly in the "West Bank" area and has a predominantly Arab population; we must remember that Abraham is almost as holy to the Muslims as to the Jews. Nevertheless, Jews have lived at Hebron since the day Abraham bought a field and a cave from Ephron the Hittite, to bury his wife. Matthew 6:31-34: Therefore take no thought, saying, What shall we eat? or, What shall we drink? or, Wherewithal shall we be clothed? For your heavenly Father knoweth that ye have need of all these things. But seek ye first the kingdom of God, and his righteousness; and all these things shall be added unto you. Take therefore no thought for the morrow: for the morrow shall take thought for the things of itself. Sufficient unto the day is the evil thereof.